Pat Brazill rocks! 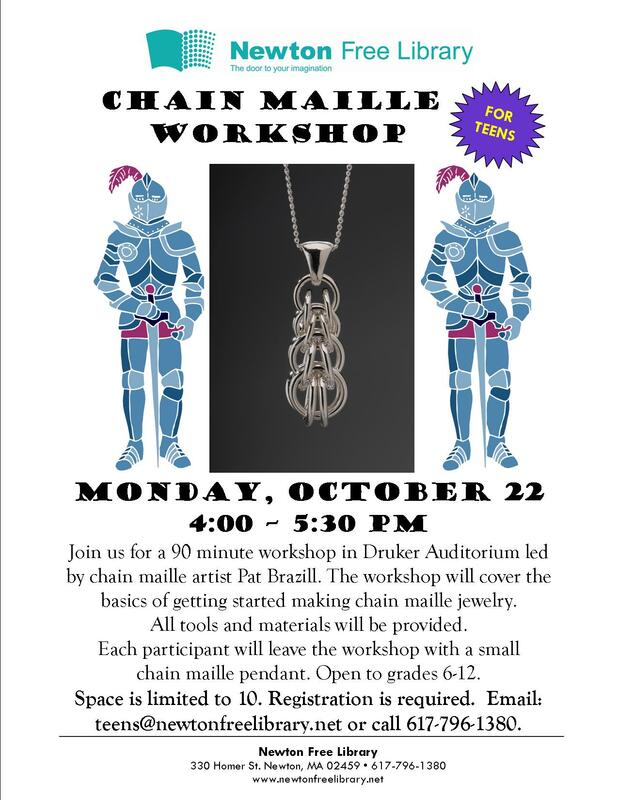 She has a display in the Newton Free Library lobby of her incredible chain maille jewelry & is honoring us with a workshop on making a chain maille pendant. If you want to learn more about chain maille jewelry, check out this guide! 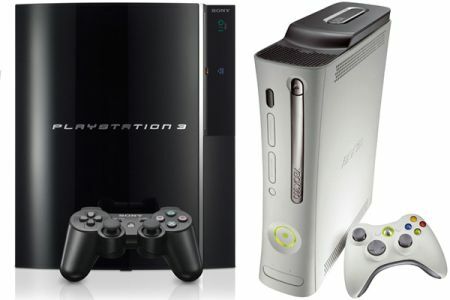 Video games @ the library! Have a week off from school? Had your fill of hiking and swimming? Stuck inside due to the rain (gotta rain at some point, right? ), but don’t feel like dropping a ton of money on a new game? Check out a video game at the Newton Free Library. Located on the third floor by the DVDs. Check out the Teen Life Community Service Fair this Sunday! See brother and sister teen duo Michael & Marisa kick off the day with a performance, followed by an A Cappella Sing-Off featuring groups from Newton North High School, Milton Academy, and Brookline High School, among others. Meet representatives from leading non-profit organizations in the Boston area to learn about volunteer opportunities for students in grades 7-12. I just heard about this new search game, A Google A Day, that Google launched the other day. This new page has been designed to give you a daily trivia question to complete using a customized Google search built specifically for the game. The questions become harder as the week progresses, much like the crossword puzzles in many newspapers do, and just like those very crosswords, the results are posted the next day in the NY Times! But you can also find the answer right under the daily question, by clicking on the “Show Answer” link. This sounds fun, but one of the biggest spoilers in playing the trivia game would be to hear about the answer in tweets or blogposts that might come up as you were doing your searches; this has also been addressed with the new Deja Google search. The search bar on the A Google A Day website seems the same as any normal Google search bar….. HOWEVER, it is indeed very different. With Deja Google search, they have created a search bar that will only show web history from before the game began, and block any social updates you might normally come across. This is all to ensure that you won’t run into any tweets or blog posts with the answers. Very cool! Here’s an example: the Question for April 16: In April 1896, I shot and killed a man. Eight months earlier, that man shot and killed a man who 17 years prior was famously reported to have killed 42 men. Who was the man I shot? So all you trivia buffs and master searchers will no doubt want to give it a try…. If you are looking for one-stop shopping for links related to Graphic Novels and Webcomics, a great place to start is with the Internet Public Library’s page for Graphic Novels. It is loaded with resources ranging from the history of the genre to Japanese manga and Webcomics. Check it out! FYI, the Internet Public Library2 (www.ipl.org) is a public service organization with collections designed, built, created and maintained by thousands of students, volunteer librarians, and information science professional. The entire site is a fantastic treasure trove of selected Internet links — just being selected for this website makes a link a trusted source. An easy way to keep up with programs and other happenings at the Newton Free Library is to hit the Like button on our Facebook pages! Then we’ll be part of your Newsfeed, with our updates centered around our library-world. So why not “Like” ’em all…..